Fortitude: An intriguing plethora of questions! Described by the towns governer as “one of the safest towns on earth”, Fortitude, a stunningly picturesque town surrounded by the Arctic Circle successfully marries an all-star cast with a thrilling story of the truths and deceptions behind the ‘everyone’s happy’ facade. For those who have yet to watch the episode, or just for future reference as the series continues, the first thing you need to get your head around with Fortitude – an icelandic mining village surrounded by the dangers of polar bears – is there is a lot of characters. So, although looking at all the snow and ice may make you have the urge to go and make a cup of tea – don’t! Otherwise you’ll be pretty baffled as you try to follow the whodunnit aspect along with who is connected to who. Once you’ve got that down it’s pretty much a thriller, mixed with a bit of Nordic Noir, mixed with a touch of the X-Files. 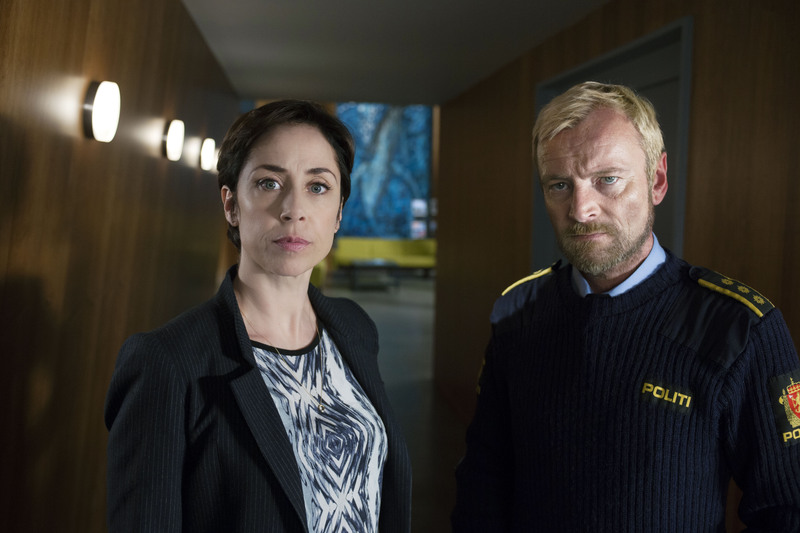 The Killing‘s Sofie Gråbøl plays town governor, Chief of Police and lawyer Hildur Odegard (proof if you ever needed it of the female ability to multi-task), who is hell bent on building a glacier hotel to boost tourism, which she needs emimnent environmentalist Charlie Stoddart (Christopher Eccleston) to write a report backing her plans. However, two children, one of whom is the daughter of local miner Ronnie, discovers the priceless remains of a Mammoth. Enlisting the help of his work colleague Jason, Ronnie offers to split the money if they sell it to Artic Research Centre. However, Jason’s attempt to sell to Stoddart fails and instead leads to Stoddart telling the Governor that he’s no longer prepared to back the hotel because of the new discovery. When Stoddart (Christopher Eccleston) is later found dead by visiting research scientist Vincent (Luke Treadaway), his chest violently cut open. It’s soon realised that this is no polar bear attack but a savage murder. Poor Vincent is hauled off in cuffs clearly innocent but denied freedom so as to avoid the public panicking about not having a suspect. Meanwhile, his fellow scientist Natalie Yelburton has gone missing. Joining the list of suspects who had clear motives, there’s also questions regarding Frank and Jules Sutter, whose son Liam (who also discovered the Mammoth) comes down with a mysterious illness, which could be mumps, could be polio. Search and Rescue officer Frank is too busy having an affair with local hotel worker Elena to notice when his son wakes up and leaves the house catching severe frostbite. With amputation on the cards his mum Jules is happy to grasp at the not so friendly doctor’s suggestion of taking him to the research centre to put him in the hyperbaric chamber. That is until squealing alerts her to what appears to be a mutated or at least experimented on pig in a chamber just like her son’s. Could the experiments be apart of Elena’s “monsters” story along with Stoddart’s wife hinting how they listen out for the chimes? Or is Elena talking metaphorically about Anderssen, as she appeared bothered by his advances, so much that she was ready pointing a gun at the door he’s standing behind? Of course with the town never having had to deal with a murder and Anderssen’s ability to handle the case (due to his drinking and no knowledge of how to conduct a murder investigation) along with his questionable innocence, DCI Eugene Morton (Stanley Tucci), a Met detective and pathologist arrives to help with the investigation much to Anderssen’s chagrin. There’s another mystery in how Morton knew to come considering he must have travelled before the second murder took place? Where they already suspicious about Pettigrew? With such a great cast and so much to take in its hard to pick out everything that makes Fortitude work along with so many compelling performances but top of the list is Richard Dormer‘s who plays the many facets of his character from trusted pillar of the community to dubious enforcer.